The Hotline Fire Drake Solar Energiser HLS18 can power up to 1.5km of snigle line tape or wire (if kept free of vegetation) and is a good option for short fences. The unit contains the energiser, battery and solar panel, making it very easy to use and move. The solar panel charges the internal battery. Eventually, like with your mobile phone, the battery will need replacing which is easy to do and inexpensive (replacement rechargeable batteries cost approx £36). 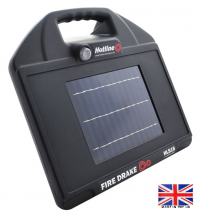 The FireDrake 18 is a low-powered, 0.18 joule, energiser with a high capacity 2.5w solar panel which is more than capable of keeping its built-in 12v 7Ah battery charged even whilst in use. This Solar Powered Energiser is ideally suited for shorter garden or smallholding systems, and for strip grazing tape fences. Very portable with its carry handle, it has an internal 12 volt 7 amp hour battery and comes with a mains charger and full instructions. The energiser has a light to indicate it is working and to warn you if your battery is getting low. It also has an on/off switch. Fire Drakes can be post-mounted or mounted on the T Earth Stake (not included). Please note: FireDrakes require a 1m earth stake. We suggest the t-earth stake. FireDrakes are made here, in Devon. They come with a 3 year warranty. Approx fence distances: 1.5km of single line tape or wire (kept clear of vegetation). We Say: Very user-friendly and reliable. This is such a time saver!